Okay, Plants on Deck is cleaning house.Wanna’ help? 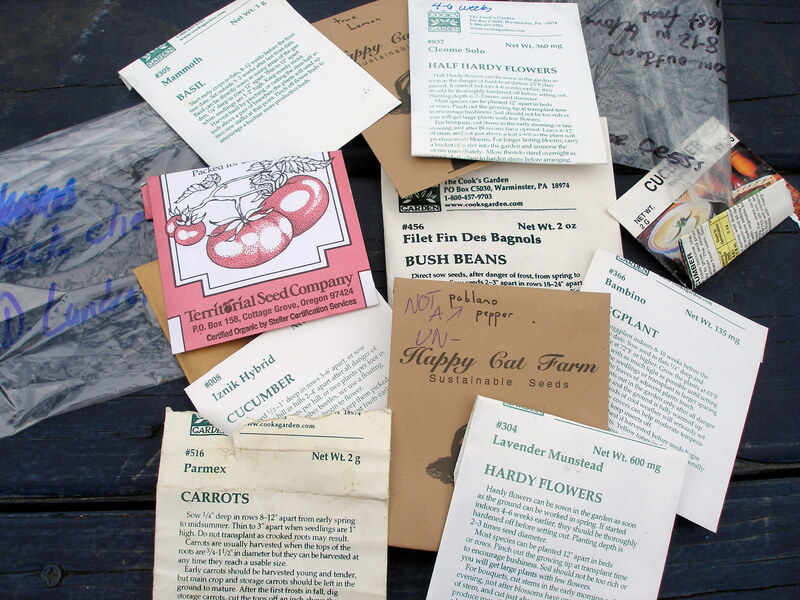 Volunteer to adopt some seeds! Gardening tools have been cleaned and hidden away (for that matter, shelves have been dusted, bathroom scrubbed, kittens emptied, and kitchen cabinets scoured — but that’s all a little tangential, sorry) and pots have been stashed for the winter. And guess what? There’s a pile of seeds that aren’t going to wind up on deck again next year. Want ’em? Just let me know. Fire off an email to plantsondeck at gmail.com and they’ll arrive in your mailbox. Voila. It’s that easy. Just sharing the gardening love. Parmex carrots (Cook’s Garden): Cute, little golf ball-sized sweet carrots. Great for containers and companion planting. Not-A-Poblano (Happy Cat Organics): AKA jalapenos — produced heavily. Mammoth Basil (Cook’s Garden): Super-huge leaves. Great for pizzas. Fairly mild. True Lemon (Happy Cat Organics): Prolific lemon cucumber. Assertive, slightly bitter taste. It’s time to start retiring the metal pots — at least some of them. Poor POD just blistered in the sun this summer; the least we can do is try a few heat-reflecting planters instead of the heat-conducting ones that look so purty. This year’s targeted plants on deck date (April 20) proved to be a little early. Each year promises are made that this will be the year that POD’s minder demonstrates restraint and won’t submit tender seedlings to the elements before those elements are ready for them. Next year’s targeted drop date for the important stuff is May 7-21. Which, conveniently, will fall on what one hopes will be a lovely spring weekend. So, what does that mean in terms of a POD 2011 seed-starting timeline?